This species is accepted, and its native range is Mexico to Brazil. It is used to treat unspecified medicinal disorders and as a soil improver. A native of S. America, cultivated as an ornamental, also subspontaneous. Alt. 27 - 2600 m.
Cultivada en Colombia; Alt. 27 - 2600 m.; Amazonia, Andes, Islas Caribeñas, Orinoquia, Valle del Cauca. Annual herb, decumbent or erect, branched from the base and also above, ± 15–60 cm. ; stem and branches striate or sulcate, ± densely clothed with appressed white hairs at least when young. Leaves broadly lanceolate to oblong or elliptic-oblong, 2.5–12(–15) × 2–4(–6) cm., narrowed to an ill-defined petiole below, thinly pilose on both surfaces, the pair of leaves subtending the terminal inflorescence sessile or almost so, broadly ovate to subcordate-ovate. Inflorescences sessile above the uppermost pair of leaves, usually solitary, globose or depressed-globose, rarely ovoid, ± 2 cm. in diameter, whitish to pinkish or deep red; bracts deltoid-ovate, 3–5 mm., mucronate with the shortly excurrent midrib; bracteoles strongly laterally compressed, navicular, ± 8–12 mm., mucronate with the excurrent midrib, furnished from the apex almost to the base of the dorsal surface of the midrib with a broad irregularly dentate crest. Tepals similar to those of G. celosioides but longer (6–6.5 mm. ), the outer more lanate and the inner less markedly indurate at the base. Staminal tube subequalling the perianth, the 5 teeth deeply bilobed with obtuse lobes subequalling the anthers; pseudostaminodes absent. Style and stigmas together ± 2.5 mm. ; stigmas divergent, subequalling or slightly longer than the style. Capsule oblong-ovoid, compressed, ± 2.5 mm. Seeds compressed-ovoid, ± 2 mm., brown, almost smooth, shining. Annual herb, decumbent or erect, branched from the base and also above, c. 15–60 cm. ; stem and branches striate or sulcate, more or less densely clothed with appressed white hairs at least when young. 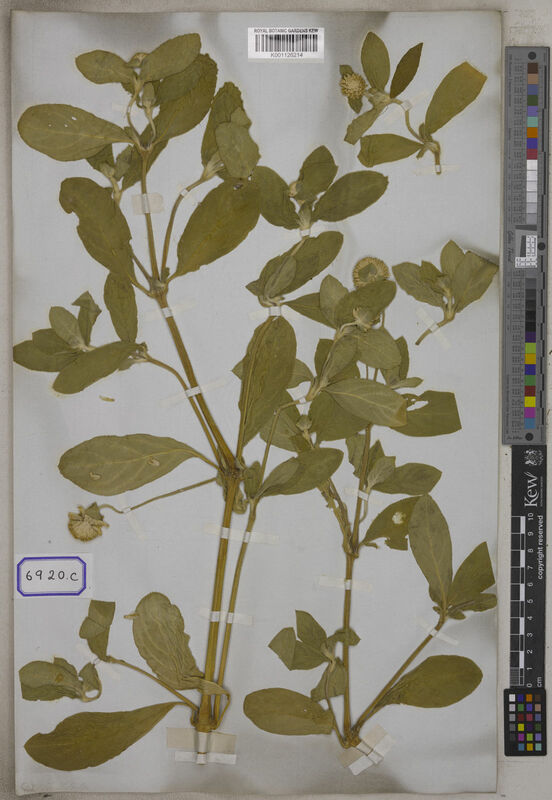 Leaves broadly lanceolate to oblong or elliptic-oblong, 2.5–12 (15) × 2–4 (6) cm., narrowed to an ill-defined petiole below, thinly pilose on both surfaces, the pair of leaves subtending the terminal inflorescence sessile or almost so, broadly to subcordate-ovate. Inflorescences sessile above the uppermost pair of leaves, usually solitary, globose or depressed-globose, c. 2 cm. in diam., pinkish to deep red; bracts deltoid-ovate, 3–5 mm. long, mucronate with the shortly excurrent midrib; bracteoles strongly laterally compressed, navicular, c.8–12 mm., mucronate with the excurrent midrib, furnished from the apex almost to the base of the dorsal surface of the midrib with a broad, irregularly dentate crest. Style and stigmas together c. 2.5 mm. long, stigmas divergent, subequalling or slightly longer than the style. Capsule oblong-ovoid, compressed, c. 2.5 mm. long. Seeds compressed-ovoid, c. 2 mm. in diam., brown, almost smooth, shining. Live plant (in situ) - Used for food security, phytoremediation and crop rotation systems in arsenic-contaminated agricultural soils (Signes-Pastor et al. 2015). Gomphrena eriopoda Gillies ex Moq. Inmortal, perpetuas, siempreviva, inmortales, manto de cristo, para todo, alumbra a las once, dondiego morado, sandiego. Signes-Pastor, A. J., Munera-Picazo, S., Burló, F., Cano-Lamadrid, M., & Carbonell-Barrachina, A. A. (2015). Phytoremediation assessment of Gomphrena globosa and Zinnia elegans grown in arsenic-contaminated hydroponic conditions as a safe and feasible alternative to be applied in arsenic-contaminated soils of the Bengal Delta. Environmental monitoring and assessment, 187(6), 387. Cavaco in Mém. Mus. Nat. Hist. Nat. Paris, sér. B. 13: 167 (1962). Hauman in Flore du Congo Belge et du Ruanda-Urundi, 2: 80 (1951). R. O. Williams, Useful and Ornamental Plants in Zanzibar and Pemba p. 277 (1949). Peter, Flora von Deutsch-Ostafrika 2: 245 (1932). J. G. Baker & C. B. Clarke in Flora of Tropical Africa 6(1): 75 (1909). L., Sp. Pl. : 224 (1753).